Your building houses multiple tenants with restricted door access, how are your tenants going to receive their mail? The PostBoxShop is the leading provider for multiple occupancy post boxes, creating affordable and convenient mail solutions. Our post boxes are used by many large building industry leaders and recommended by various European Post Offices as we are compliant with British Standards and Royal Mail requirements. All of our post boxes confirm to European Norm Quality Control Levels to guarantee our products are of the highest standard for your building. When deciding what mail solution is appropriate for your tenants you need to deduct where the main collection location will be, inside the building or outside? We provide solutions for both environments. PostBoxShop products are widely used across university and college student accommodation projects. Our postboxes provide a cost efficient solution for renovating buildings into habitable student living environments. 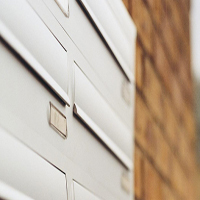 With safety being top priority for new home renters, our range of postboxes are produced to exceptionally high security standards to prevent theft of personal information. This multiple postbox system is the most appealing for convenience, there are a front delivery system and a rear retrieval application. This allows the building to obtain a higher security grade as delivery services do not require access to the building. The post boxes are made from electro galvanised steel and powder coated in any colour of your choice. This multiple postbox system is intended for the mailboxes to be built into masonry cavity walls. It can either be installed as a single unit or grouped together in a multi-tenanted building requiring a collective delivery point. This system allows for external deposits and internal collections eliminating the need to venture outdoors! When conventional wall space is lacking for a postbox installation we have a free standing postbox solution. Our free standing multiple postboxes come with a choice of stands, frames and available in various finishes. The free standing postboxes can be placed outdoors and indoors to suit your building requirements. An elegant solution of front delivery and front retrieval of mail, the recessed postboxes give a clean appearance that is flush against the wall. This multi postbox installation can be positioned either outside against a wall or on an internal wall in a lobby area. The letterboxes conform to British Standard BS-EN 13724 as well as Secured By Design guidelines. The Postbox Shop supply both individual and commercial postboxes, throughout our range, for different style properties.